We use our mobile phones for many things, like keeping in touch with loved ones, online banking and checking our social media. I also use my mobile phone to help organized over the busy holiday season. The holiday hustle and bustle is enough to make anyone stressed, but with a little organization in place, it goes much smoother. Take advantage of all the features your mobile phone has to offer and stay on top of what needs to be done during the holidays. 1. To-do list. Your mobile phone is always with you; therefore, so is your to-do list. I use an app for my to-do list, but you could also keep it simple and write it in Notes. Keep track of everything that needs to be done so you don’t forget anything important. 2. Keep track of gifts. I record a note in my phone each time I buy a gift for someone so I know who I still have left on my gift-giving list. It also helps to ensure that you don’t over or underspend. 3. Online shopping. Shopping with your mobile phone is so convenient as most stores are mobile friendly. Get all your shopping done with a few simple taps. 4. Find DIY holiday decor. The Internet is full of beautiful holiday crafts that are easy to make and won’t break the bank. I love to make my own decor and most of my ideas I get online. 5. Keep tabs on your holiday spending. It’s easy to go overboard with gift-giving. If you are keeping track of your budget with your phone, it’s much easier to stay on track. 6. Send out invites to holiday parties. Instead of sending our snail mail invites, why not send out a mass email and get the job done immediately? You’ll save time and paper and guests can respond sooner rather than later. 7. Find recipes to make. Making delicious food is my absolute favourite part of the holidays. I have my old faithfuls that I make every year, but I also like to try new recipes to keep things fresh. Need a new phone to help you prepare for the holidays? Or maybe buy one for a gift? I recommend visiting The Mobile Shop and talking to the Mobilist™ team. They are THE experts on all things mobile (phone and plans). I love that their advice is unbiased so you can find the perfect phone and plan to suit your needs. You can find The Mobile Shop in select Loblaws, Fortinos, Zehrs, Atlantic Superstore or Real Canadian Superstore locations near you. It’s convenient because you can stop in while you are picking up your holiday supplies. As an added bonus, you can earn PC Optimum points on select purchases. Who doesn’t love to earn points? 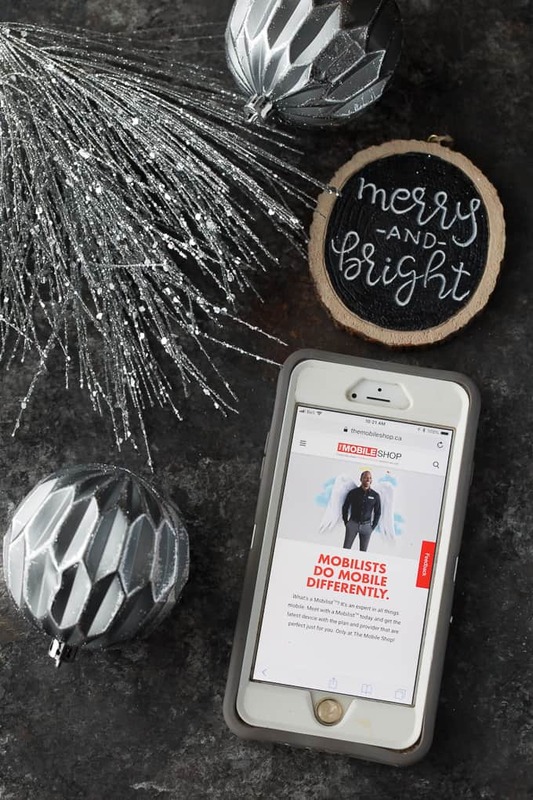 How do you use your mobile phone to prepare for the holidays?